I guess this could do with it's own thread as it's a mixture of genres this time. I got decent haul of stuff from the first KS. The PVC isn't great on thin details but hopefully they've learnt from that. I'm just not seeing anything to tempt be into this one so it might be one to pick up a few bits from retail later. Following the release of TerrainCrate, we’ve been inundated with suggestions from the community about extra pieces of scenery we should make. From modern, post-apocalyptic scenery to WWII bunkers and spooky mansions, the scope of ideas was absolutely massive. Plus, we wanted to go back and fill in some of the gaps from the original dungeon offering, with pieces like beds, bathroom fittings, a kitchen, etc. The list quickly became so massive that we realised we would need an equally massive Kickstarter to really do it justice. Unlike the first campaign, which focused solely on fantasy pieces, TerrainCrate 2 will do things a little differently. We’ve got some key themes in each of the crates that will mix together very nicely and find a home in loads of board games, RPGs and wargames. Plus, once again, it’ll all be made in hard-wearing PVC plastic. We’re planning to have four Crates on the Kickstarter, including Gothic Estate, Modern Life, Occupied Town and Abandoned Village (all names TBC). Across these four Crates, we’re going to cover a load of different periods, settings and uses. What’s more, if you want to pick up four Crates (and who wouldn’t) there will be a great all-in deal during the Kickstarter. I was close to backing the first one, but held off. I have not seen any from the first Kickstarter out in the wild, or even seen them painted. How did they turn out? Does anybody here have any experience with the product? I did the first KS. It's fine for what it is, scatter terrain. The pieces paint up good, there's some mold lines and bits the clean up, but it's nothing too bad and would probably be fine if you don't mind seeing them. I keep telling myself I'm going to paint it all, but there's so much stuff and it's on top of the mountain of other stuff I kept telling myself I was going to paint, which is also on top of another mountain of stuff I promised myself I was going to paint. This new stuff looks cool but there's only a few scattered pieces I would use.. maybe just some of the old timey shop pieces. It's pretty bendy, think cheapo green army men. Some of the new stuff looks like it's made for people 9ft tall﻿. Another Mantic kickstarter, heh ? Better wait this to hit retail. And yes, the material used for these pieces is pretty much crap - especially the small pieces that bend all the time and barely are worth painting. It's kinda cheap, I guess, so that's their main advantage. Cuteness for the Cute Goddess! Bendy might be a hidden blessing for one of those sets, the one with the clock, the bureau, the chair, etc.. Add a candlestick and a Beast to lead them, and you've got a warbamd. I was really excited about the possiblities of this stuff... then it all showed up and was completely overwhelmed, both with how much work was going to need to be put into it (painting and straightening) and where in the world I would end up putting it all. Ended up flipping the whole thing and managed to make a bit of extra cash, and still ended up with some due to more Terraincrate stuff being included with KoW Vanguard. I'll be keeping an eye on retail this time around. At least the stuff in Vanguard is a manageable amount. Bigger pieces tended to have a lot less issues. It's tabletop. If you want something detailed, worth your time to paint, and you don't mind spending money, pick up Tiny Furniture (and Galladoria Games makes a fine modular tavern!). But for a wargame, you can't buy two trees and a fence then call it quits. Terrain Crate is economical, so you don't spend a thousand dollars -- or hours -- on terrain. Unlike Terrain Crate 1, which was pretty much generic fantasy, TC2 will span multiple genres, including World War, modern day, post-apoc, and Gothic. But how many gamers actually play in all of these genres? I don't think there will be as much demand per mold for TC2 vs. TC1. But Mantic may think the generic fantasy terrain market has enough terrain bits, and will use KS to see if and how much demand there is for other settings. Interesting. I wonder what it will cost. Certainly the same than for Terrain Crate 1. First, it will be "meh" then Ronnie will come and give "awesome bundles with crazy lots of PVC crap" to boost the hype. We know how Mantic Kickstarters happen since now, it's always the same scheme, and Mantic fanboyz are always happy to fall for it. It will fund, then hit retail before all the backers got their stuff with lower prices, and once again there will be a "small" complain about how backers aren't favored, yadayada. Nah, save the trouble, just wait for retail. Not even for pre-order : just when the actual stuff is out. Less chances to get disappointed with crappy material once you get all the reviews of the brave people buying "first hand", honestly. You really are quite bitter about Mantic, Sarouan. Yes, there's been hits and misses. The Star Saga stuff was horrendous in my opinion. However, the Terrain Crate stuff was pretty damn good. The cart was misformed, but the hot water treatment fixed it. The rest was really good and through the ks, a fantastic price. By all means, slate the bad stuff (there is quite a bit), but stop with all the falsehoods. My LGS had it in stock 2 months before backers and for 35 bucks less than the KS. These were the KS versions too mind, so not a less content retail version. It was the same with Mars Attacks, Star Saga, Duneon Saga and many many more. So, there is some truth to what he's saying. I'd say wait for retail as well, based on what I have seen. I'm also from a position of not backing a single project of theirs, except Terrain Crate for $1. So, no bitterness here, simply observations. Exactly. I too saw the stuff in retail for less than the Kickstarter while the backers weren't having their rewards. Not even talking about backers getting rid of their excess on second market. But by all means, Gimgagoo, pledge if you want to pledge. Like I said, I have no doubt it will fund thanks to the Mantic community. I have no problem waiting this to hit retail. I'm sure I will have it before all the backers and for a lower price than in the Kickstarter, anyway. Sure, you may have loads of crappy PVC material in the end, but let's be honest here : you don't need all that unnecessary quantity. What Tamburlaine said is true : in the end, you get overwhelmed by the amount of work needed to make everything look good and even selling the excess is a chore that not everyone will be happy to deal with. After all, all backers are far from being second market sellers or shop owners. Cynical ? Yes, I admit it. But let's face it : Mantic Games kickstarters share a common pattern, and I don't see why this one would be any different. What the previous ones have showed is experience enough for those willing to see. Those who don't...well, I can't force them to open their eyes, anyway. Of course, there is also the fact that I'm in Europe and with the Brexit not looking good...more reasons for me to be willing to wait for it to hit retail, rather than being f*ed by crazy shipping prices/unexpected taxes. Hmm... I browsed eBay, Amazon, and Walmart and the prices for the terrain sets are more than KS prices. Or, rather, both Mantic and resellers are repackaging the terrain pieces into smaller kits, which, per piece are more expensive than KS prices -- I think. You can see in this video that the retail versions of the terrain (which has vacuum inserts) has fewer pieces than the KS version, and are separate, smaller sets. OTOH, If the retailers were selling actual KS boxes (no inserts) or the total pieces over several retail sets is less than the KS bundles, then you are correct. Frex, here are the Mantic retail crate sets. The Battlefield Crate Set has 30 pieces for MSRP $80. The KS Battlefield Crate Set has 84 pieces for $60. And maybe *you* don't need this much stuff, but I have several dungeon sets and want enough terrain for a wargaming table as well as a town. 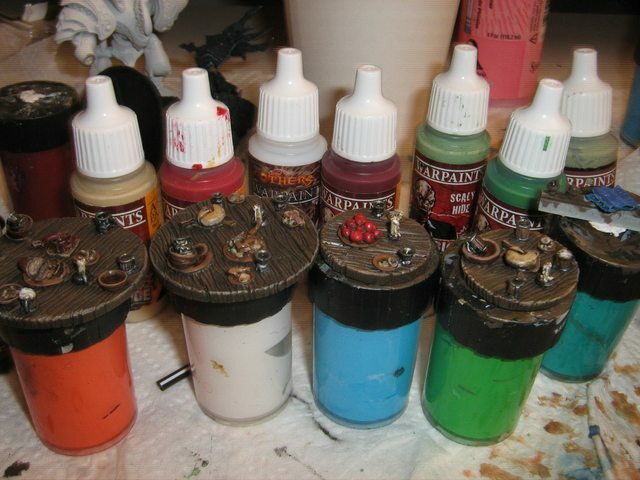 I don't need to paint every miniature and many gamers don't paint their miniatures. If KS 2 has terrain for a genre I play, I may back it. If not, I won't. Here's an unboxing of the retail product with the vacuum insert that is not the KS box. There was a new town square sculpts on Mantic's site that was not in the original KS, I wonder if they will be offered in this second KS (I don't see my local retail store having Mantic's first Terrain Crate stuff in stock). My LGS was selling them without the shipping cost, which was about 35 bucks CAD less per pledge. The LGS was selling the crates for 75CAD. So if the LGS got a retailer pledge, why were the rest of the backers in the country waiting 2 months longer to get theirs? Anyways, I'm not here to argue semantics. I just wanted to point out that these indeed see retail far sooner than backers do, and without the cost of shipping. I have been very, very happy with my Terrain Crate 1 stuff - it sees use at every game. Some is good, some is okay, very little is bad. My biggest complaint was the wagons - wobbly and bendy, and awkward to fix. But I was able to fix all of them, using binder clips as clamps to straighten the bent sides and wobbly shafts. There is very little in those sets that have not seen use. And my wife painted almost all of it in three weeks - blocking in colors, then dipping into MinWax Polyshade. The Auld Grump - the barricades, desks, and bookshelves see the most use. Some of the treasure piles have been permanently added to the bases for Reaper Bones dragons. Kilkrazy wrote: When I was a young boy all my wargames were narratively based because I played with my toy soldiers and vehicles without the use of any rules. The reason I bought rules and became a real wargamer was because I wanted a properly thought out structure to govern the action instead of just making things up as I went along. I went all in, one of everything for Terraincrate 1, but haven't gotten around to painting any of it yet. I'll be more selective this time, but if I see something I can use, I'll back it for it and toss it on the pile. I opted out of Terraincrate 1 as I felt most of the pieces didn't lend themselves to Kings of War and this one seems to do that even less. Although I'm quite happy with the pieces I got from the Vanguard kickstarter. This one seems to be very aimed at their Walking Dead properties and Rob even got the dolls house joke into the vid and which is exactly the direction I’ve felt this is going. There’s bits that interest me but probably best to wait for the small retail sets to get them. For all those times that you’ve wanted to just have a picnic during a battle - in fairness again this would be good for a walking dead scenario or you know magic carpet maybe? There’s bits that interest me but probably best to be wait for the small retail sets to get them. Believe it or not, people did have picnics to watch battles going on - right into the ACW. I'll build the comfiest Frostgrave ruin ever. It's really broader, actually. Sure, you could use those in Walking Dead (who knows, maybe no one raided that house/it got spared by the Zombie Apocalypse), but I feel like they're just not meant for this game in mind. How are they going to do the undercuts on these miniatures? fwiw, I'm painting the TIny Furniture tavern set, and they're using resin to get this level of detail. Same way as any other spin cast miniature, use a rubber mould.